Some days running around town I just want a casual, easy outfit. I got these shorts recently from J.Crew Factory and love them. They have an elastic waist that makes them so comfortable (like gym shorts), but the material is so nice, a linen/cotton blend, that makes them dressier. I also have them in 2 solid colors. I love the deep navy paired with the bright colors of the flowers. 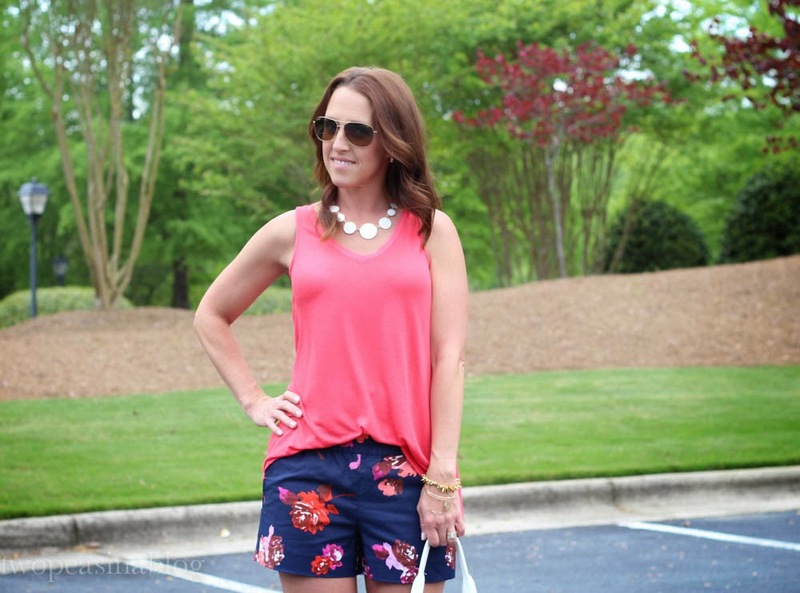 I paired the shorts with bright pink, but I think they would look fabulous with a white top or chambray. Thanks for stopping by. Have a great Friday. Shop the interactive pictures below. Thanks! Yes I love the deals I can find at JCrew Factory. They have some great sales. Thanks, I love the colors in the shorts. These are my favorite go-to bracelets!!! Anna, Thanks! Yes we are lucky here in NC to have had great weather lately. I know I'll wear these a lot this spring/summer. Brenda, Thanks. Yes I am really into bright and neon colors this spring! Love the colors in this outfit and those shorts are soooo perfect! Great look! Thanks Brooke!! I love all the bright colors I'm seeing lately. So fun. Happy Friday Elle. Thanks. My wedges are Franco Sarto from DSW, a recent buy, and I love them. They are so comfortable. Love the colour of your shorts..so cute! Nav, thanks! Navy and pink is one of my favorite color combos!! Have a great weekend. 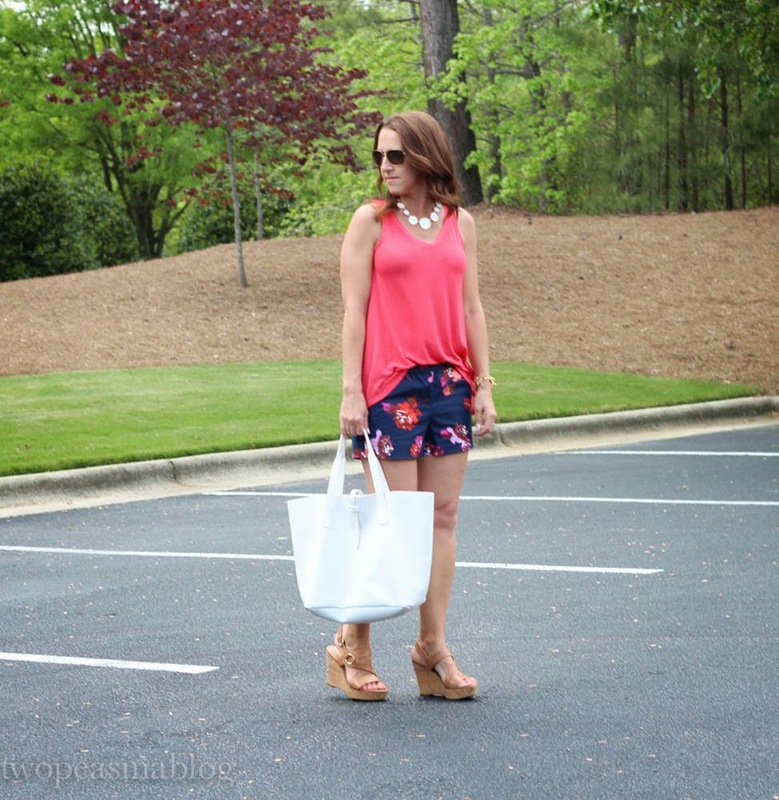 Super cute shorts and the wedge sandals are perfect! Carrie and Stacy, thanks ladies. Love J Crew Factory!! My sandals are Franco Sarto from DSW and I love how comfortable they are. That white scalloped purse you posted is so dreamy! Loving these shorts as well. I love me some J Crew! Thanks, yes that watermelon/coral color is great!! 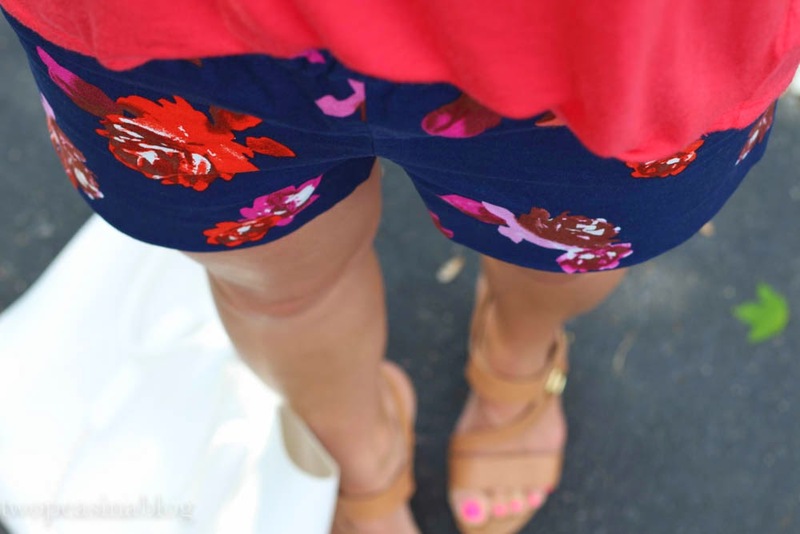 LOVE those floral shorts!! they are perfect for spring and summer. and that pink top looks gorgeous with your skin tone! Such a cute outfit! 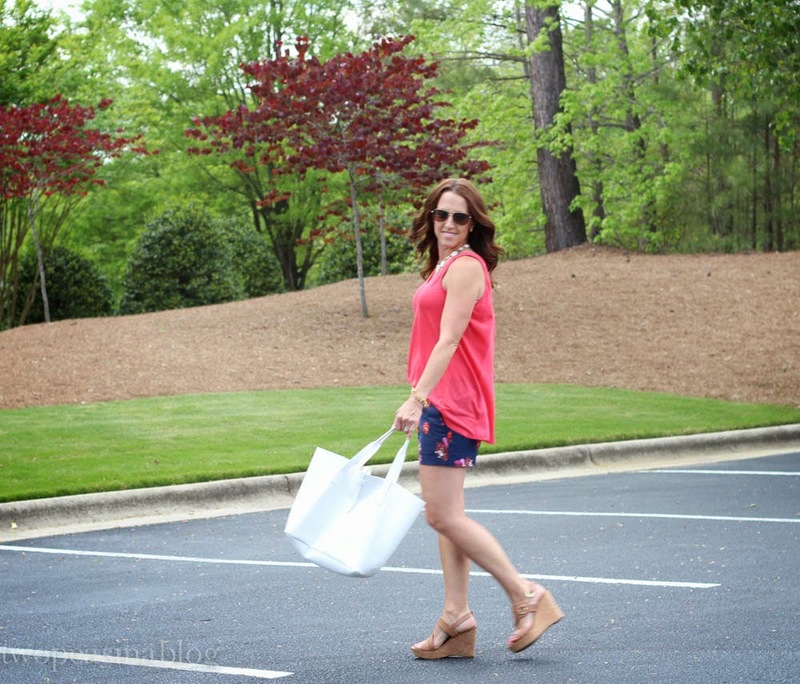 love the wedges with the shorts and I agree that the top is the perfect color for you. Jeanne, thanks. Wedges with shorts are a favorite look of mine. Such a cute comfy- casual look! I love it! 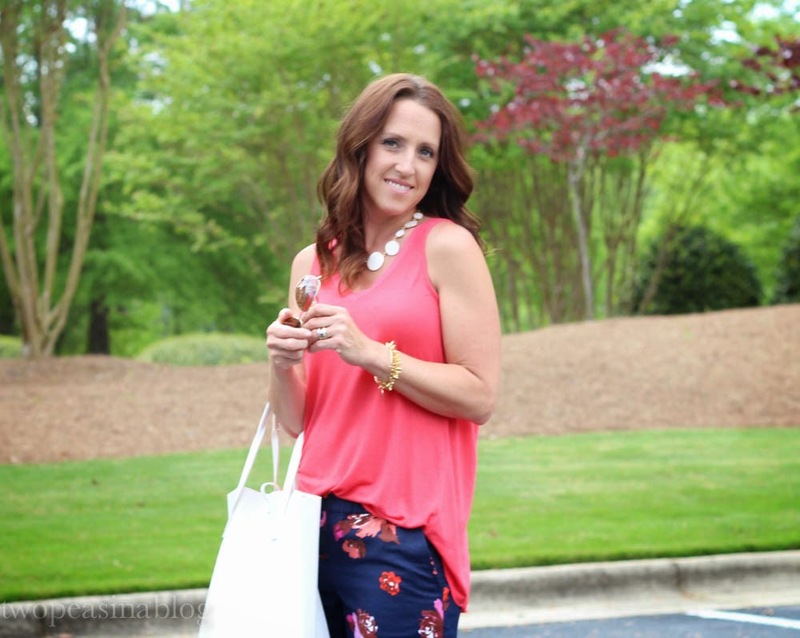 You look super cute and like you are totally ready for Summer! Get it girl! gorgeous shorts and love the coral top with them.